A 69-win season spelled an abrupt end for the D-backs front office regime that was led by chief baseball officer Tony La Russa (who remains in the organization in another capacity), general manager Dave Stewart and senior vice president De Jon Watson. 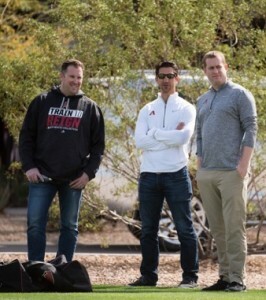 Enter new Arizona GM Mike Hazen, who tapped former standout Boston execs Amiel Sawdaye and Jared Porter, along with former Red Sox bench coach Torey Lovullo, to remake a franchise that may have lost its way. We caught up to Porter, Arizona’s senior vice president and assistant GM, in order to get a peek into the changes the Diamondbacks are implementing this season. Much is made of the Boston roots of Mike Hazen, Amiel Sawdaye, you, and even new manager Torey Lovullo. Given the different roles you all played with the Red Sox, did you conceive of a time when you might all be together again, with commensurate promotions? I’m very fortunate to have been able to learn from and work with so many talented executives in Boston. It’s one of those things where you don’t realize just how much your career can be shaped by who you work for and learn from early on—and it’s immeasurable. In my case, I happened to get an internship working with and for the best executive in baseball history, Theo Epstein. The culture that Theo created in Boston (and now in Chicago, with Jed Hoyer) is so unique. I feel like I’ve been part of an incredible and captivating baseball operations think tank ever since I started as an intern with Boston in 2004, with everybody working as hard as they can and trying to learn as much as they can, with the freedom and comfort to express opinions and explore both old and new ways of thought with regards to player evaluation, acquisition, development and analysis. I’m forever grateful to Ben Cherington, for hiring me and giving me my first opportunity. That think tank culture is certainly something we are going to try as hard as we can to replicate in Arizona. Along with others such as Theo, Jed, Ben, Raquel Ferreira, Brian O’Halloran, Jason McLeod, and Allard Baird, Mike and Amiel were big parts of that culture, with their fingerprints all over Boston’s World Series championships and current roster. Did you have an inkling that you were valued to such a degree by Mike that he would seek you out in Arizona as he did? When you left Boston after the 2015 season, leaving them behind for a year, was there any sort of exit interview/between the lines/wink-wink where you had a sense you might work together again down the line? Things never seem to happen in a linear manner when it comes to a career path, so there was never any sort of “wink-wink,” but Mike, Amiel, and myself have always been very close and have always enjoyed working together. With that said, the preexisting relationships I had when I went to the Cubs along with some very strong ones I developed over the year-plus I spent in Chicago made it a very tough place to leave, on both a personal and professional level. I think the Cubs will be just fine without me, though! What was your adjustment moving from a Ben Cherington front office in Boston to Theo’s in Chicago? Given the enormous successes both teams have had, there must be a lot of similarities. But is there a single contrast that stands out? We all worked together for so many years in Boston, making the front offices very similar in style and goals. It was a smooth transition from Boston to Chicago, given the similar styles and scouting/development infrastructures coming from what Theo instilled in all of us in Boston. The biggest difference between the two front offices is that the Cubs have really pressed forward with regards to analytics and new forms of data analysis, because Theo was able to pick up from he left off in Boston while starting from scratch in Chicago. Data analysis is nonstop for them, with a perfectly designed platform to access all of this information. From minor league coaches, to scouts, to major league coaching staff, the analytics make everyone more efficient and knowledgeable. It’s an area that we have already started, and will continue to press forward with, on the Diamondbacks. Does Theo give you crap for walking into a 103-win team and cherry picking a ring? [Laughing] No, he doesn’t. But I give it to myself! Admittedly, it was great timing for me. I’m really lucky that he and Jed gave me the chance to be a part of winning a World Series with the Cubs. The ring is a nice bonus, but the amount I was able to learn being around those guys again for another year-plus, and being ingrained into the great culture they (along with manager Joe Maddon) have created in Chicago is my biggest takeaway. Theo’s probably given me more crap for cherry picking from the culture, and I don’t blame him. They have a great thing going there. As long as we’re talking Cubs, can you give me your personal Game 7 experience? And it’s true. The twists and turns throughout the Series and specifically in Game 7 were captivating and gut-wrenching. The Indians were and are a great team; it could have gone either way. I’ve been fortunate to be a part of a few world champions over the years, so the best part for me is seeing players, coaches, front office executives and scouts win one for the first time. To me, that provides an incredible amount of gratitude. It serves as a reminder of how tough it is to be part of a team that wins it, and also how lucky all of us who work in baseball are to be a part of it. Speaking of breaking 108-year droughts, do you practice any particular superstitions in spite of being an analytics-driven kind of fella? I don’t want to say too much here—and acknowledging that it’s the players who win games on the field—but we’ll do just about anything in the front office suite during a game to change our luck and try to will the team to get a few runs. Typically it involves a lot of hot dogs, chocolate cake, and even the occasional vegetable crudité and tapenade combo. Part two of this Q&A, which focuses on Porter’s preferred statistics/metrics for player evaluation, his front-office responsibilities in Arizona and the Diamondbacks’ 2017 roster, will run tomorrow afternoon. Follow Brett Ballantini on Twitter: @PoetryinPros. Photo courtesy of Sarah Sachs / Arizona Diamondbacks communications department. don’t know about the rest of you, but they look like the worst boy band ever.